A tasty yet simple recipe, perfect for midweek cooking when time is limited. 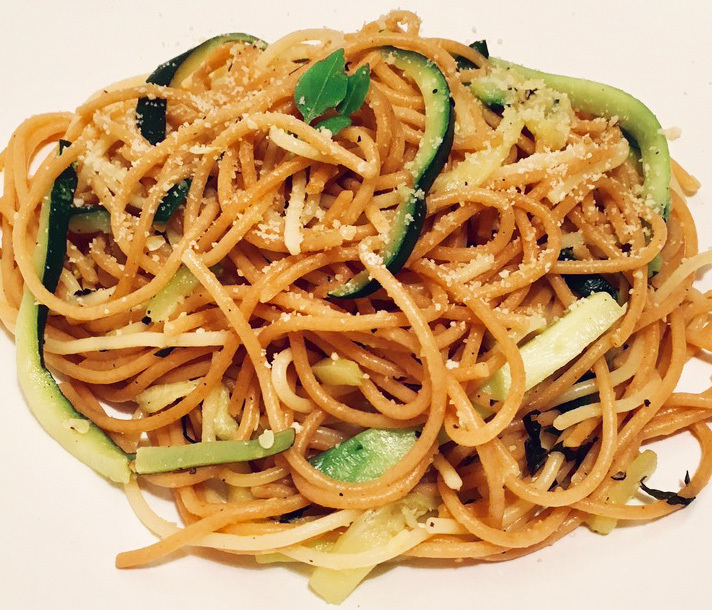 You can make the dish vegan by removing the parmesan and, for a bit of variation, mix whole-wheat and normal spaghetti. 20g vegetarian parmesan – check the label as some traditional parmesan isn’t vegetarian! 1. Start by boiling the water for the pasta in a large pot. Make sure to add salt, as this gives the spaghetti a nicer taste. 2. Whilst the pasta is cooking, start slicing the courgette lengthways and then cut into thin, long spaghetti shaped slices. 3. Check on your pasta. Once ready, strain but make sure you save a mugful of the cooking water for later. 4. Meanwhile, place a large frying pan on medium heat and add the olive oil and courgette slices. 5. Tossing the courgettes regularly, cook until they become translucent. This doesn’t take too long. Then mix in the pasta as well as a splash of the reserved cooking water. 6. Cut the lemons in half and squeeze in the juice. Keep stirring the pasta to distribute the flavour evenly. You can add one or two of the lemons, depending on your taste preference. 7. Wash then tear up the mint leaves and add to the pan as well as some salt and pepper for seasoning. 8. Serve and sprinkle with some grated parmesan. Squeeze a final dash of lemon over your dish, garnish with mint and enjoy!